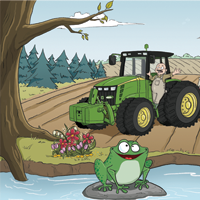 When we were developing interactive online teaching materials for danish high schools and agricultural colleges, we used Anita to make a large amount of illustrations with a humorous touch. It was a real pleasure to work with Anita, and the result was an unbelievable success. Anita is a very positive and warm, highly professional and dedicated illustrator, whom in high spirits were trying to meet customer requirements, with creative input and ideas. We highly recommend Anita and we will definitely use her in the future. 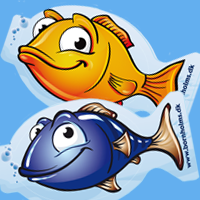 We have had the pleasure of working with Anita when we were developing a brand new children’s concept: Fiskehaps. A healthy snack for children’s lunch boxes. We earlier had another illustrator for the job, but we didn’t think we found the right “look”. Anita got that immediately, and she quickly and profesionally developed a whole series for the concept. We’re really pleased with the outcome, and since the price is right too, we chose to have further material made for the concept. Lastly, I want to mention the flexibility which we have appreciated very much i more stages of developement, where we didn’t really knew ourselves what we were looking for. Anita can always point to me, if she needs further recommendations. When we were developing a whole new concept “Isabella & friends” for girls in the age 6-12 year, we got contact to Anita through Tegnebordet. She created a couple of test drawings for us, and after that there were no doubt that Anita should be on our team for this project. Subsequently, Anita has created hundreds of small and large illustrations for this concept. She’s incredibly fast and always filled with good ideas and is great to spar with. Anita works extremely focused and is always quick to catch our ideas and put them into practise, which means, that the illustrations most of the time can be approved right away. The illustrations she create are always super detailed and excites us time and time again. This is also one of the reasons why Isabella & friends is becoming a success worldwide,- this is Anita definitely a huge part of. We hope to be able to work with Anita many years to come, and get lots of more fantastic Illustrations! The first time I contacted Anita, to talk about drawings for my Bella Sara project, I was very positively surprised by the profesionalism and energy I was met with. We have worked together for almost 7 years now, and it has been a pleasure, every time we start on a new series. Anita is an amazingly carefully, detailed and skilled illustrator. 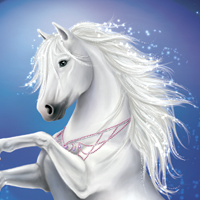 She has through the years been able to deliver all we have needed; drawings of horses, people, fairies, other interesting characters, castles and beautiful nature backgrounds. Anita is very flexible in the cooperation, which have been of significant importance to us. She has always met the deadlines, and also been able to deliver earlier in urgencies. We have worked together with illustrators from all around the world, and Anita is clearly one of our best illustrators. 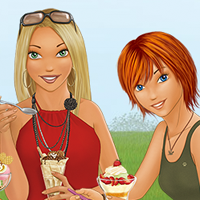 It’s not without reason that she has illustrated our front figures Bella and Sara several times. I have experienced an empathy and a commitment beyond the usual.